This beautiful golden lotus flower appeared during our 2012 Continuation Dharani Class, the day Zanze Pandit Enlivened the Mahabodhi Temple statue. The lotus plant had been a gift to the temple and looked after by many, especially the nurturing hands of Charlotte. 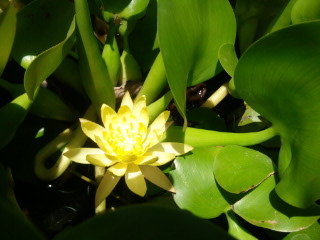 The first and only other time this lotus plant bloomed was March 2011, just after Master Yu return from China. When I saw the lotus I felt a tingling vibration through my whole body, a physical sign, proof to me that Master was here empowering our space and blessing our sincere efforts. Sharing this blessed sign made our family gathering even sweeter. Daily the changing bloom brought smiles to all our faces, reminding us of our own Buddha nature…that everything is changing and nothing is permanent. It is my feeling that this was not only a blessing for our Dharani gathering; it was also a blessing to the Mahabodhi Temple and its many supporters. Images of Buddhas come in all shapes and sizes, nature shows us the way.